Sprayable Energy takes just a couple of quick sprays onto your skin and you get a steady energy for several hours. 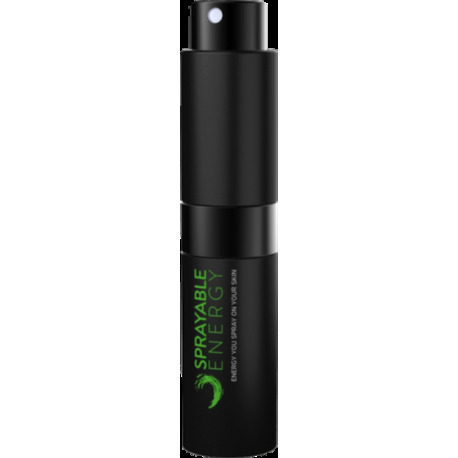 Sprayable Energy is the fragrance free energizer that won't leave you with a giant crash. Each black aluminum bottle contains 40 doses. Sprayable Energy is the safe alternative to coffee and energy drinks. Since you spray it on your skin, you get a smooth delivery of caffeine as it is slowly absorbed through the skin. And unlike other highly caffeinated products, there is no giant crash when the caffeine wears-off. Instead you feel more awake, more alert, and more focused. How do you use it? Simply spray four times anywhere on your body for a single dose. How often can you use it? Up to six sprays in four hours. And after you spray it on you'll almost forget that it's there because it's not scented. Then you'll realize that your having the day of your life because the energy is unlike anything you ever experienced.